The Bataleon Goliath gives you a camber type feel when flat basing but a very catch free edge. 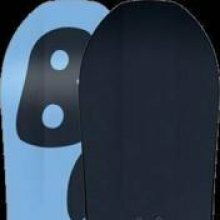 The one problem I felt was it was soo much like camber than when you committed to an edge for a harder turn or ollie or jump it suddenly turned into a washy rocker board. Conditions: Good conditions with some occasional hard spots. 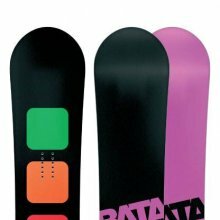 The Bataleon Goliath dropped the -10 setback for 2013 and became much more of a centered freestyle to all mountain freestyle ride. 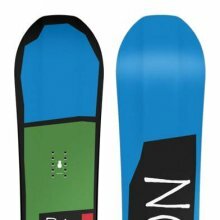 On Snow Feel: This has the feel and ride of a camber board without the catch. 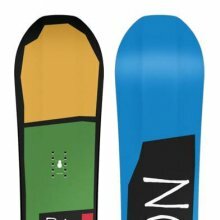 It flat bases really well, super easy to one foot and all around a fast stable ride. It can take on the mountain in a more edge to edge all mountain kind of way or in a spinny freestyle kind of way but it’s not ideal for those who like to turn. Turn Initiation and Carving: Pretty easy edge to edge. 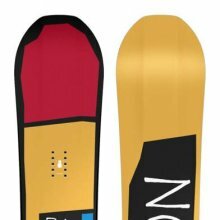 The board’s edge meets the snow in the middle but the tip and tail are turned up and it can be a little weird. What I mean by weird is not loose but sometimes a little more difficult getting to your edge in harder snow. Laying into a harder carve doesn’t work that well and you have to dial committing to the edge back. It feels more like a rocker board. 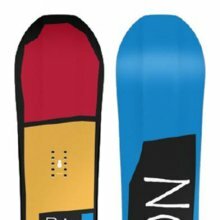 Speed: Not bad for a board of this design and it’s pretty stable at moderate speeds. Uneven Terrain: Not bad when conditions get rough or semi-bumpy at the end of a crowded Saturday. Approximate Weight- Pretty light. Nothing exceptional but probably on the lighter side of medium. Edge Hold: We’d like to see a little more going on with the sidecut to grip a little more. It’s on the average side of good. Switch: Perfect switch because it’s now a twin. The older models were almost perfect. 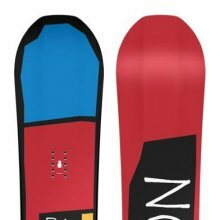 Rails/Jibs– Not bad but also not a jib specialist. Pipe: Camber is fun in the pipe but we’d like the edge hold to be a little better. It’s good but something felt off compared to the average pipe board that we prefer. Jumps: It’s got decent spring but it slips out underfoot when you try to Ollie if you load it on the edge near the tip/tail. Same goes for the triple base camber when approaching the jumps. If you like to spin off jumps it’s really fun but if you like to be slightly on edge it can feel weird and washy. Some get used to it and some don’t. I didn’t like it in the short time I rode it. We try to get as many images of the Bataleon Goliath, but forgive us if they're not all there. 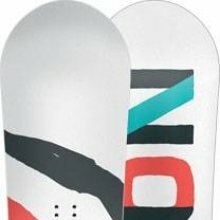 I rode this board all season. My thoughts are with the good ride team however i would disagree on the flex of this board. I find it pretty stiff and I am unable to butter on it. I ride a 156 and it is a bit of a beast.